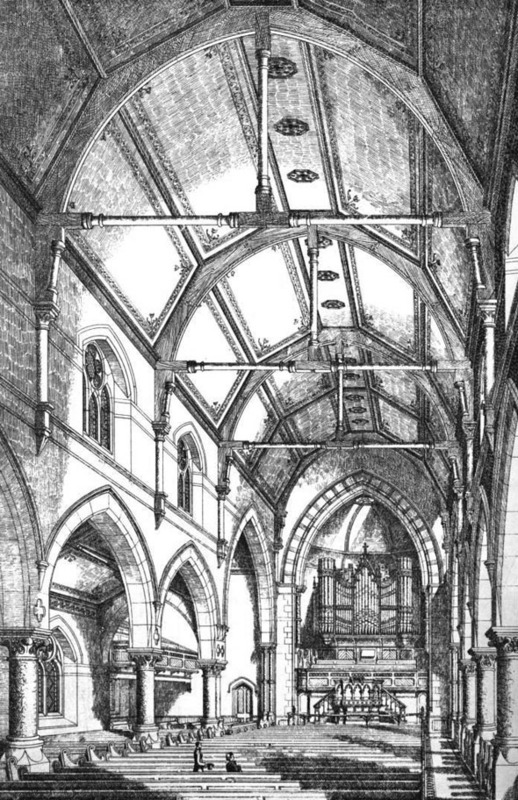 From The Architect, January 30, 1875: “Designs were recently submitted by the following architects in a limited competition for this church, none of which were accepted: – Messrs. R. Baldie, Glasgow; J.T. Cowan, Glasgow; Hugh Barclay, Glasgow; Campbell Douglas & Sellars, Glasgow; Bruer & Sturrock, Glasgow; T. L. Watson, Glasgow; Geo. Bainks, London. The design we illustrate is by Mr. George Baines, of 26 Finsbury Place, London, and Accrington.” Eventually a design by Thomas Lennox Watson was selected and constructed.